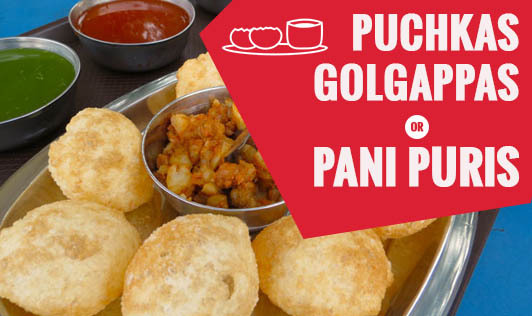 Puchkas, Golgappas or Pani Puris.....call them what you wish, they are a favorite street food for most urban Indians. Last week I visited the land of rossogollas, Kolkata, after a gap of 4 years. Having sat through a day-long meeting, a group of us set out to Esplanade, New Market and Park Street to browse, shop and of course get some exercise. We couldn't resist the puchkas and jhal muri leave alone the mishti doi and flurys. I had forgotten how different puchkas of Kolkata taste compared to the pani puri of Mumbai. I find the meetha juice that goes along with pani puri much more tangy and sweet compared to the one with puchkas. The puchkas are also much bigger and harder to take a mouthful at one shot, compared to the smaller pani puri. There was no channa or moong along with the aloo in the filling of puchkas...a bit of a disappointment there. The difference in taste lies in the ingredients that go into each of these regional preparations. Would any of you like to share the recipe of pani puri or puchka, with the readers? Do send me the recipe and I shall publish it in this section with your name.